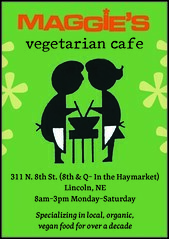 Maggie's Cafe is a locally-owned restaurant that provides organic, non-GMO and locally-sourced food to the Lincoln community. We sell low-carbon, low-impact and responsibly sourced vegetarian and vegan food. Since opening in 2000, we have steadily increased our certified organic and non-GMO ingredients to ninety percent of our inventory. 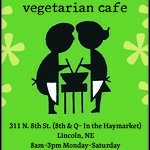 We purchase our produce from small scale Nebraska farmers and other food products from Nebraska artisan producers and proudly display their pictures on our walls. In addition to our local produce, our baking flour, honey, cheeses, corn tortillas, hot sauces, herb/spice blends are all crafted by hand here in the heartland. We also make and sell our own all natural salad dressings. Maggie's Cafe recycles and composts nearly all of the business's waste. We produce less then 1 pound of trash in one day (which usually consists of tape, broken rubber bands, twist ties, bottle caps and some saran wrap). By way of comparison, an average restaurant produces 200 pounds of trash on 1 day. Our mission is to provide healthy food for people and the planet while supporting those farmers and producers who are committed to doing the same. So all may eat well, be well and live well.